In 1770, American protests led to Parliament&apos;s repeal of the Townshend duties — except for the duty on tea retained by the British as a matter of principle. The colonists demonstrated their displeasure with the remaining tax by drinking smuggled tea. The effectiveness of American resistance was shown in the precipitous decline in tea sales in the colonies — a drop of 70 percent over three years. Boston Tea Party, 1773. In the contest between British Parliament and the American colonists before the Revolution, Parliament, when repealing the Townshend Acts, had retained the tea tax, partly as a symbol of its right to tax the colonies, partly to aid the financially embarrassed East India Company. The colonists tried to prevent the consignees from accepting taxed tea and were successful in New York and Philadelphia. At Charleston the tea was landed but was held in government warehouses. At Boston, three tea ships arrived and remained unloaded but Gov. Thomas Hutchinson refused to let the ships leave without first paying the duties. A group of indignant colonists, led by Samuel Adams, PaulRevere, and others, disguised themselves as Native Americans, boarded the ships on the night of Dec. 16, 1773, and threw the tea into the harbor. In reply Parliament passed the Boston Port Bill (see Intolerable Acts). Governor THOMAS HUTCHINSON allowed three ships carrying tea to enter Boston Harbor. Before the tax could be collected, Bostonians took action. On a cold December night, radical townspeople stormed the ships and tossed 342 chests of tea into the water. Disguised as Native Americans, the offenders could not be identified. (December 16, 1773) an organized refusal by Boston merchants to accept a shipment of tea, in protest against tea taxes retained after the British Parliament&apos;s repeal of the Townshend Acts. Patriots known as Sons of Liberty, led by Samuel Adams, Paul Revere, and others, dressed as Mohawks, boarded several British East India Company vessels and dumped 300 chests of tea into Boston Harbor. In 1765 The British Parliament enacted the Stamp Act, a tax on legal and commercial documents, including print materials such as pamphlets and newpapers, requiring a special stamp to be placed on all, in order to transfer part of the cost to operate the American colonies to the colonials themselves. The Stamp Act was the first direct tax imposed on the colonies by Britain. The Townshend Acts, which were taxes levied on the colonies by Parliament for items such as glass, lead, paint, paper, and tea, were enacted in 1967. These acts together caused a stirring of unrest among the colonials, who were beginning to feel unfairly burdened, and Parliament eventually rescinded the Acts after several colonial boycotts, leaving only the tax on tea. Boston Boston Tea Party 1773. In the contest between British Parliament and the American colonists before the Revolution, Parliament, when repealing the Townshend Acts , had retained the tea tax, partly as a symbol of its right to tax the colonies, partly to aid the financially embarrassed East India Company. The colonists tried to prevent the consignees from accepting taxed tea and were successful in New York and Philadelphia. At Charleston the tea was landed but was held in government warehouses. At Boston, three tea ships arrived and remained unloaded but Gov. Thomas Hutchinson refused to let the ships leave without first paying the duties. A group of indignant colonists, led by Samuel Adams , Paul Revere , and others, disguised themselves as Native Americans, boarded the ships on the night of Dec. 16, 1773, and threw the tea into the harbor. In reply Parliament passed the Boston Port Bill (see Intolerable Acts ). 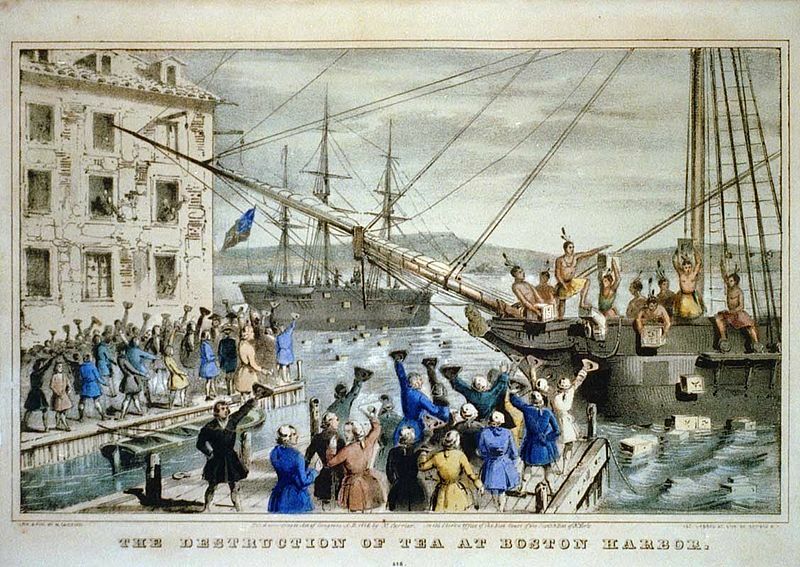 The Boston Tea Party was an act of direct action protest by the American colonists against theBritish Government in which they destroyed many crates of tea belonging to the British East India Company and dumped it into the Boston Harbor. The incident, which took place on December 16, 1773, was a major catalyst of the American Revolution and remains an iconic event of American history. George Hewes, a Boston shoemaker, was among those who boarded one of the ships dressed as an Indian. Sixty years later, as one of the last surviving members of the Tea Party, he recalled the events of that night and his participation in that historic moment. Author Alfred Young in his book "The Shoemaker and the Tea Party" described Hewes as "a nobody who briefly became a somebody in the Revolution and, for a moment near the end of his life, a hero." The Boston Tea Party was an event which took place on December 16, 1773, when a group of Bostonians boarded ships of British East India Company and dumped 342 chests of tea into Boston Harbor, becoming one of several major incidents which led to the American Revolution two years later.The Boston Tea Party was an event which took place on December 16, 1773, when a group of Bostonians boarded ships of British East India Company and dumped 342 chests of tea into Boston Harbor, becoming one of several major incidents which led to the American Revolution two years later. In 1773, Britain&apos;s East India Company was sitting on large stocks of tea that it could not sell in England. It was on the verge of bankruptcy. In an effort to save it, the government passed the Tea Act of 1773, which gave the company the right to export its merchandise directly to the colonies without paying any of the regular taxes that were imposed on the colonial merchants, who had traditionally served as the middlemen in such transactions. With these privileges, the company could undersell American merchants and monopolize the colonial tea trade. The act proved inflammatory for several reasons. First, it angered influential colonial merchants, who feared being replaced and bankrupted by a powerful monopoly. The East India Company&apos;s decision to grant franchises to certain American merchants for the sale of their tea created further resentments among those excluded from this lucrative trade. More important, however, the Tea Act revived American passions about the issue of taxation without representation. In an atmosphere of continuing suspicion and distrust, each side looked for the worst from the other. In 1772 the crown, having earlier declared its right to dismiss colonial judges at its pleasure, stated its intention to pay directly the salaries of governors and judges in Massachusetts. Samuel Adams, for many years a passionate republican, immediately created the intercolonial Committee of Correspondence. Instead of rescinding the remaining Townshend tax and exploring inoffensive methods of aiding the financially troubled British East India Company, Parliament enacted the Tea Act of 1773, designed to allow the company to bypass middlemen and sell directly to American retailers. It was hardly a plot to persuade Americans to drink taxed tea at a low price, but the colonists interpreted it in that fashion. On May 10, 1773, Parliament passed the Tea Act. The Tea Act was meant to save the East India Tea Company from bankrupcy. It allowed the East India Tea Company to send half a million pounds of tea to America subject only to a three cent per pound tax. This would allow it to undersell smuggled Dutch tea and legally imported tea. The tea was to be delivered to consignees in New York, Charleston, Philadelphia and Boston. At the beginning of 1773, the East India Company found itself greatly embarrassed by the American nonimportation agreements concerning tea. That Company had seventeen million pounds of tea in store unsold. They could not pay dividends nor debts. Bankruptcies were the consequence, and these produced so great a shock to credit that a panic prevailed. The Company implored the ministry to take off the duty on tea. The ministry refused, for the royal prerogative forbade it. Leave was granted to the Company to send tea to America on their own account, without paying an export duty, and so enable the colonists to buy it cheaper from England than from any other market. The king and Lord North, losing sight of the principle involved, foolishly thought this measure would quiet the Americans, "for," North said, "men will always go to the cheapest markets." So another opportunity for reconciliation was lost. Victory in the French and Indian War was costly for the British. At the war&apos;s conclusion in 1763, King George III and his government looked to taxing the American colonies as a way of recouping their war costs. They were also looking for ways to reestablish control over the colonial governments that had become increasingly independent while the Crown was distracted by the war. Royal ineptitude compounded the problem. A series of actions including the Stamp Act (1765), the Townsend Acts (1767) and the Boston Massacre (1770) agitated the colonists, straining relations with the mother country. But it was the Crown&apos;s attempt to tax tea that spurred the colonists to action and laid the groundwork for the American Revolution. Compare different accounts of the same event. At considerable expense, Britain had won France&apos;s North American territory in the Seven Years&apos; War (1756-1763). Britain now faced a large postwar debt and the responsibility of additional land to protect and govern. Highly burdened by taxes themselves, the British were merely asking the colonies to bear the expense of their own administration and defense. As each proposed revenue bill met with opposition, it was repealed, Parliament being anxious to appease the colonies. But such "lenity" only encouraged additional disobedience, which was skillfully orchestrated by colonial propagandists. On the evening of December 16th, 1774, three English ships waited to be unloaded at Griffin&apos;s Wharf. They carried a special cargo of East Indian Company tea, which had been granted a royal monopoly in America, and carried with it a special tax. Revolutionaries had prevented the boats from being unloaded, but Governor Thomas Hutchinson kept them in port waiting. During this period in history, women were not often considered suitable to be involved in political matters. When a group of women colonists banned together and signed a pledge to boycott tea in an effort to show their support of the colonists, they depicted by a British Cartoonist as the Edenton Ladies Tea Party.